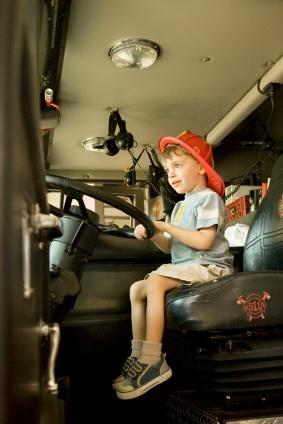 Children can learn about fire safety during National Fire Prevention Month. October has been designated as National Fire Prevention Month -- a time when public service departments across America join forces to spread the word about fire safety. Each year, the campaign focuses on a different aspect of safety, from preventing forest fires to planning an escape route during a blaze. While the campaign lasts the entire month, most police and fire departments designate the second week of October as Fire Prevention Week, during which demonstrations and expos are held in different U.S. cities. Sponsored by the National Fire Protection Association (NFPA), Fire Prevention Month has roots that date back to The Great Chicago Fire of 1871 that killed more than 250 people and left more than 100,000 homeless. The fire, which was reportedly started in a barn, also burned more than 2,000 acres and destroyed about 17,400 structures. The three-day fire, which started October 8, did most of its damage on October 9, 1871, which is why Fire Prevention Week is always held around that date. The first National Fire Prevention Day was declared by President Woodrow Wilson in 1922, and the week-long observance is the longest running public safety and health campaign on record. In 2000, the NFPA extended Fire Prevention Week to include the entire month of October, and entities such as public libraries, schools and utility companies joined in to spread the word not only about fire safety and prevention, but overall personal safety. Pamphlets on water conservation, seasonal fire safety, and correct use of smoke and carbon monoxide detectors, as well as fire extinguishers.